Blackmagic Duplicator 4K Blackmagic Design has released the Blackmagic Duplicator 1.0.2 update, which is designed to dramatically increase the performance of H.265 files on the latest playback devices. Since the Blackmagic Duplicator 4K was launched in April, new H.265 playback devices have been released and customers have also been providing feedback on the playback performance of the H.265 files. This feedback has been used to improve the codec in the Blackmagic Duplicator 4K, and this software update provides these improvements to all Blackmagic Duplicator 4K customers. Blackmagic Duplicator 1.0.2 update can be downloaded free of charge from the Blackmagic Design website. The customer response to the Blackmagic Duplicator 4K since its launch has been favorable, because it gives them an easy way to generate revenue from live events. This new update has been designed based on their direct feedback and features many improvements to the H.265 hardware codec to create great-looking video at even lower bit rates, as well as making the mp4 files compatible with even more playback devices. These improvements allow customers to use slower computers and a wider range of 4K televisions to play back high-frame-rate, Ultra HD H.265 files. In addition, Blackmagic Duplicator 1.0.2 update improves AV synchronization on all recordings, especially with long recordings and when recording multiple files with the append record feature. Blackmagic Duplicator 1.0.2 also reduces the delay when detecting a new video input signal, so recording can start quicker. Customers also get improved communication between duplicators when multiple duplicators are connected together for a large daisy-chained set that are used in combination for recording more than 25 copies at once. "Customers love the new Blackmagic Duplicator 4K and have been providing feedback directly to Blackmagic Design engineers," said Grant Petty, CEO, Blackmagic Design. "Blackmagic Duplicator 1.0.2 update is so exciting because it lets customers create mp4 files that are compatible with even more big-screen televisions, computers, and other playback devices. The Blackmagic Duplicator 4K gives videographers a way to create and package video content that they can sell immediately after any event, whether it's a school play, a wedding, a band performance, conference, or anything else. Now there's a way to live duplicate recordings at the event in either HD or Ultra HD and sell it to eager parents, fans, and attendees the moment the show is over! It's a truly fantastic win-win solution for customers and program creators!" The Blackmagic Duplicator 4K allows delivery of Ultra HD content to consumers by recording files onto inexpensive SD cards that can be distributed to customers the moment an event is finished. Featuring 25 built-in SD card recorders, multi-rate 12G-SDI connections, and a real-time H.265 encoder, Blackmagic Duplicator 4K delivers Ultra HD content that customers can actually view on their 4K televisions and Windows 10 computers today. The Blackmagic Duplicator 4K lets content creators increase revenue because it gives them a way to sell content right after a live event, while attendees are still excited about the performance, before they walk out the door. Now customers can sell concert videos to fans as they leave the venue, to parents after their children's latest performance or recital, after sporting events, conferences, sales seminars, and more. The Blackmagic Duplicator 4K encodes video using H.265, which is the new standard for Ultra HD delivery, and saves files in an open file format onto standard SD cards. 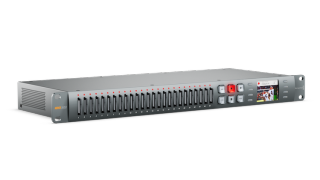 The built-in, real-time H.265 hardware encoder gives customers Ultra HD video, even at high frame rates up to 2160p60. The H.265 video looks better than the older H.264 standard, and the files are small with low data rates, so content can play back from standard SD card media. With H.265, Ultra HD content is not much larger in file size than a HD file would be in the older H.264 standard. Featuring 25 SD card recorders miniaturized into a single rack unit, the Blackmagic Duplicator 4K uses standard, common SD cards that are readily available, super thin, inexpensive, and very fast. Cards can be used for SD, HD, and Ultra HD video up to 2160p60 and are compatible with Windows 10 computers. With the addition of a USB adapter, SD cards can even be plugged directly into most consumer Ultra HD televisions for immediate playback of the video. The built-in H.265 encoder is so efficient that a one-hour Ultra HD program can easily fit onto a very inexpensive 8GB SD card. The front-panel controls are designed to make duplicating content as easy as possible, and feature six large illuminated buttons for record, stop, lock, append, menu, and remote. The lock button prevents accidental interruption of recording during an event, and the append record button combines recordings from different parts of an event into a single file. The Blackmagic Duplicator 4K features advanced, multi-rate 12G-SDI connections that can record all SD, HD, and Ultra HD formats up to 2160p60. For larger events, multiple duplicators can be stacked using the SDI loop thru and RS-422 deck control. This lets customers encode and duplicate to an unlimited number of SD cards in real time. When recording is started or stopped on the first duplicator, the others automatically follow. There is also an optical fiber SFP socket for adding an optional SMPTE-compatible optical fiber SDI module when working in larger venues with long distances between equipment. Adding optical fiber SDI directly into the duplicators could be very useful when duplicators are set up close to the merchandising stands away from the production area, so that cards can be handed to customers for quick sale.